‘Pannfisch’ is a rather typical dish from Hamburg – and it is basically fried fish. 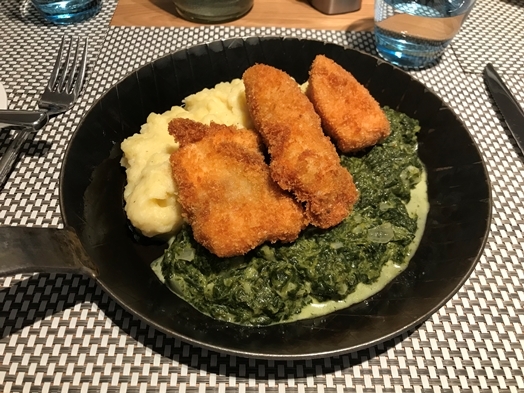 I went for the “Pannfisch ‘Hamburger Jung’, served with dip, mashed potatoes and cream spinach)” (EUR 24.00). The dish was okay in terms of taste and flavour – however, given it was EUR 24.00 I think it is quite a bit overpriced for Germany. You get similar or better for less. Admittedly, the place is nice if you manage to get a table by the window but else I’d say it is kind of not that amazing. The interior is generally lovely and the service is friendly but I must admit that they are not in the best of shapes in terms of attentiveness. They are here but not really. The bread and spread was not really brought to the table but forgotten on the next table. All in all, the VLET an der Alster does not match the VLET I’ve been to a couple of years back. At least prices for the beverages are okay with EUR 4.00 for a “double espresso” and “EUR 7.50” for a bottle of water. Still, booking is recommended.